There are a number of innovative procedures available for use in qualitative research, including observation, note-taking and verbal protocol techniques. This paper highlights the potential usefulness of stimulated recall as an innovative technique for use in qualitative research in sport and possibly exercise. Specifically, it focuses on video footage obtained from head-mounted cameras for use in stimulated recall during post-event interviews. Examples of research studies carried out in simulation training with fire and emergency personnel and with leisure participants in a whitewater adventure setting, are used to illustrate how stimulated recall can be utilised effectively in practice. Participants in a river-surfing course completed daily qualitative semi-structured interviews, facilitated by footage from head-mounted video cameras. The cameras were worn throughout the course while participants were in the water. The use of the headmounted equipment and video-footage as stimulated recall in the study and preliminary findings about the procedure are described. Finally, a number of advantages and disadvantages of head-mounted camera and stimulated recall procedures in general are discussed. 2012 Taylor & Francis. 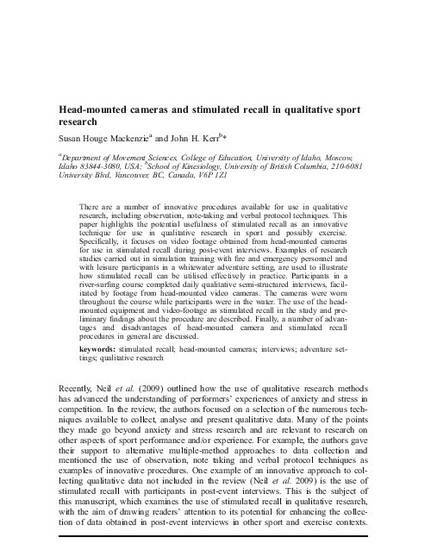 This is an electronic version of an article published in Qualitative Research in Sport, Exercise and Health.